The idea that science is making philosophy and religion largely redundant reappeared recently in the form of an essay in The New Republic (subscription required) by evolutionary psychologist Steven Pinker. While repudiating the belief that scientists should be entrusted to solve all problems, the Harvard professor defends another version of “scientism” that comes very close to it, as philosopher Marie I George explains in the following article. Scientism: legitimate label or boo-word? While relatively few people embrace the extreme version of scientism, nonetheless numerous individuals embrace it in a weaker form. While they do not go so far as to proclaim science the sole arbiter of truth, they do have what I define as an attitude or mindset that chronically overestimates what science can teach us, an attitude rooted in ignorance of the limitations of the scientific method,. A method or a way or proceeding has to fit what is being studied if it is to prove fruitful. So, for example, to expect to discover the existence of non-physical entities through empirical observation is absurd. This kind of expectation, nonetheless, is all too common. For example (following the discovery in 1995 of a micro-organism -- Symbion Pandora -- living on the lips of some lobsters) the editors of the prestigious medical journal The Lancet voiced the hope that “a scientist as inquisitive as the one looking in the lobster’s mouth and marveling at S Pandora will come across evil, maybe from the preserved brains of those afflicted….Should that happen, evil will be classifiable and may even prove reversible.” And Pinker himself laments that even non-believers revile “the application of scientific reasoning to matters of religion,” as if questions concerning God, the afterlife, etc. could be answer through experimentation. As Aristotle observed long ago, people can get in the habit of using a given method successfully and then wrongfully conclude that method works everywhere. A proper education can help prevent this from occurring. A liberal education includes a philosophical reflection on the different branches of learning and their methodologies. Pinker’s assertion that science is “indispensable in all areas of human concern, including politics, the arts, and the search for meaning, purpose, and morality” shows gross ignorance of the sort of question that can and cannot be answered using the scientific method with the accompanying overconfidence in science’s explanatory power -- this is precisely what constitutes scientism in its second sense. What questions can science answer? Those that can be answered through observations generally made in the context of experiments that are performed in view of testing hypotheses. Science then plainly cannot establish that “the laws governing the physical world (including accidents, disease, and other misfortunes) have no goals that pertain to human well-being,” as Pinker claims it does. Laws do not “govern” in the manner intelligent agents do; rather they simply expresses a regularity among natural phenomena (e.g., when the temperature of a gas goes up, so does the pressure it exerts against the wall of its container according to the formula PV=nRT). Pinker is hardly the only one to overestimate science’s role in human knowledge. Contrary to what he seems to believe, many other thinkers are rightly accused of scientism. Biologist William Provine, for example, in his essay “Evolution and Foundation of Ethics,” asserts that: “Modern science directly implies that the world is organized strictly in accordance with mechanistic principles. ... There are no gods and no designing forces that are rationally detectable.” Provine appears to identify “rationally detectable” with detectable through empirical observation, something which obviously is unable to detect an immaterial entity; not to mention he speaks as if philosophical arguments for God’s existence starting from natural phenomena had not been proposed by philosophers, starting with Aristotle. It does not appear to cross his mind that perhaps the scientific method cannot answer this question. Provine goes on to tell us that science also directly implies that “when we die, we die and that is the end of us.” While a philosopher might propose a defense of materialism, and infer such a position from this defense, it can in nowise be tested through an experiment. Plainly Provine’s scientism does “threaten…the spiritual health of our nation,” contrary to what Pinker would have us believe. The same is true of many of those who propose bio-psychological explanations of religion, such as Pascal Boyer in Religion Explained, and Daniel Dennett in Breaking the Spell: Religion as a Natural Phenomenon. The same applies to the view that science has shown that people do not have souls. Biologist Steven Jay Gould, in Ever Since Darwin, articulates the widespread view that evolutionary continuity between ourselves and chimpanzees renders the concept of soul antiquated. Yet, does material continuity explain the human capacity for abstract thought? This is plainly not a scientific question, but rather a philosophical one. Pinker while giving lip service to the difference between fact and value is quick to assert that we need science if we are to have “the moral values of an educated person.” Ethics has its own principles and its own methodology, and they are quite different than those of science. Science can certainly help in the application of moral principles and conclusions, but not in the very formulation or derivation of them. For example, our ability to correctly apply the moral principle, “Do unto others…”, is helped by science which informs us that second hand cigarette smoke is bad for human health. The moral principle at the root of this reasoning, however, is not the result of some experiment. Pinker naively wants to rehabilitate “scientism” with a positive meaning delimited in terms of a commitment to the notions that the world is intelligible and that the acquisition of knowledge is hard. Of course, the realist philosophers, such as Aristotle, acknowledged these two things long before the birth of modern science. It would be nice to see some “hard work” behind Pinker’s sweeping statements, for example: “The moral worldview of any scientifically literate person—one who is not blinkered by fundamentalism—requires a radical break from religious conceptions of meaning and value.” Instead we are given bald, unscientifically founded assertions, such as that “all the world’s traditional religions and cultures—their theories of the origins of life, humans, and societies—are factually mistaken.” Whether or not a human being is the product of solely material evolutionary causes is not a question science is able to answer. Pinker’s assertion reveals his gross ignorance of what sort of question is philosophical and what sort is scientific. It is not difficult to see, then, that overweening confidence in the ability of science to answer questions that lie outside the reach of its method is far from being a rare phenomenon nowadays—indeed Pinker provides us a prime example of it. Again, the antidote to scientism is philosophical training consisting of reflection on the different methodologies appropriate to the various subject matters. Limiting oneself to scientific training alone makes it all too easy to unwittingly import the scientific method into areas where it does not apply. Marie I. George is Professor of Philosophy at St. John’s University, New York. An Aristotelian-Thomist, she holds a PhD from Laval University, and a MA in biology from Queens College, NY. She has received a number of awards from the Templeton Foundation for her work in science and religion. The Bahrain Center for Human Rights (BCHR) expresses grave concern over the escalated level of impunity in Bahrain that has gone as far as detaining the fathers of victims of extra-judicial killings who continue to demand justice for their sons. On 11 August 2013, Ahmed Abbas Mowali was arrested from Arad following a police attack on a peaceful protest calling for rights and freedoms. On 13 August, the public prosecution ordered Mowali's detention for 45 days pending investigation on charges of “illegal gatherings”. Ahmed Mowali is the father of Yousif Mowali, 23-years-old, who was arrested, tortured and then drowned in January 2012. At the time, his mother was told at the Samaheej police station that Yousif was at the Criminal Investigation Department (CID) and that he was fine. A few days later, police said they found Mowali's body floating in the water on 13 January 2012 in the Amwaj area. A state doctor reported the cause of death as drowning and ruled out signs of violence. However, a second autopsy performed by an independent forensic pathologist concluded Mowali was electrically tortured, and was unconscious when he drowned. The investigation into Yousif Mowali's death has not made any progress, and no one has been held accountable for his death or his torture. On 22 August 2013, Abdulhadi Mushaima was arrested from his home following a raid by riot police and security officers dressed in civilian clothing during the early hours of the morning. On 24 August, he called his family and informed them that he was given a detention order of 45 days. He was interrogated at the public prosecution in the absence of a lawyer and was charged with “illegal gathering” on the basis of his participation in peaceful protests. Mushaima is the father of Ali Mushaima, the first protester to be killed in the Bahraini protests on 14 February 2011; Ali Mushaima was killed in front of his own house by police officers firing birdshot. Since his death, Mushaima's family has been subjected to ongoing attacks by the authorities. The family's home has been attacked more than three times. On 13 January 2012, their home was directly attacked with tear gas after security forces raided the house by entering through the kitchen, where they broke teapots and assaulted the deceased victim's sister by spitting in her face and shouting at her. From what she recognized, the security forces were Yemeni and they were filming the assault. The officers attempted to beat Ali Mushaima's father, then they threw tear gas at the entrance of the house, which caused it to spread throughout the house. Ali Mushaima's aunt was present at the time, and the tear gas caused the 83-year-old woman to have difficulty breathing, high blood pressure, and an infection in her kidney, all of which she had not suffered from prior to the attack. Although the family attempted to leave the house to escape the toxic gas, the security forces encircled the home and prevented their exit for a period of time. On 31 January 2013, the 3rd Criminal Court sentenced one policeman who is accused of “the beating that led to the death” of Ali Mushaima to seven years in prison. He was released during the appeal trial and the court will hear his appeal on 16 September 2013. BCHR believes that both Ahmed Mowali and Abdulhadi Mushaima were targeted and detained for exercising their basic rights and publicly demanding justice for their murdered sons. BCHR has previously documented several cases of attacks on families of extra-judicial victims that included detention. On 26 October 2012, Jawad Al-Shaikh was arrested at a peaceful protest in Manama that demanded self-determination. Until this day, no one has been held accountable for the death of his 14-year-old son, Ali Al-Shaikh, who was killed by police with a shot to his neck from behind on 31 August 2011. These arrests are acts of intimidation directed at all other relatives of killed victims, who continue to accuse the regime with the killing of their sons and continue to participate in peaceful protests to demand justice. This is part of a systematic policy of granting impunity to the violators of human rights as a previous report by BCHR shows. Compensate families of extra-judicial killings both morally and materially for their losses, as well as for the attacks they have been subjected to. BCHR also calls on the international community to condemn the Bahraini regime's use of vengeance in the cases of families of victims of extra-judicial killings. Prince Johan Friso, of the Netherlands, has died at 44 in his mother's residence, the Huis ten Bosch Palace in The Hague where he was with family on vacation. He remained in a coma for a year and a half after being hit by an avalanche at an Austrian ski resort in 2012. The prince was buried in the small village of Lage Vuursche, near the castle where his mother, former Queen Beatrix, plans to retire. The funeral was officiated by the same cleric who performed his wedding ceremony. He was the younger brother of the new king of the Netherlands, Willem-Alexander. After the accident Prince Friso was transferred to the Wellington hospital in London, where he lived. In July he was moved back to the Netherlands. According to a government communique, "Prince Friso has died of complications related to the hypoxic brain injury, which he suffered as the result of his skiing accident in Lech, Austria on 17 February 2012"
The media immediately began speculating whether this was a case of euthanasia. The consensus is that it was not. Most importantly, Prince Friso had not left a living will, so his family and doctors could not presume his consent. As well, Dutch euthanasias are often carefully-planned affairs, with the family gathered around the bed. But Friso's death seems to have caught the Royal Family unawares, as the King was with his family on holidays in Greece. People who know about these things predict accused NSA leaker Edward Snowden will soon be very unhappy he chose Russia as the place to avoid prosecution in the United States on espionage charges. Snowden was working as a computer network manager for the National Security Agency in Hawaii, but turned up in Hong Kong earlier this summer and began releasing information about secret electronic surveillance programs the agency uses to monitor telephone and internet traffic around the world. Then when the United States started seeking his arrest and extradition, Snowden took a plane to Moscow, where he holed up in an airport international transit zone hotel while he tried to find a more permanent place to settle outside America’s reach. There was talk of Cuba or Venezuela, but those didn’t work out. After a month, Moscow granted him asylum for 12 months despite fierce objections from Washington. David Barrett, a national security expert teaching at Villanova University, says Snowden will soon find out, if he hasn’t already, that Russia may not be the ideal place for a self-proclaimed whistle-blower. “One of the things that [Russian President Vladimir] Putin said when he spoke of the possibility of Snowden’s staying there, is that Snowden would have to be quiet,” Barrett said. “He would have to stop saying things and revealing things about U.S. intelligence. “And I don’t think that that would be a very happy existence for Snowden if he had to live under those conditions where he could not speak to reporters and groups about NSA,” Barrett added. “The Russians specialize in that sort of thing where somebody shows up at your doorstep and there is something very pathetic about this. You have nowhere else to go - you are throwing all of your trust, your faith into the Kremlin,” said Savodnik, whose upcoming book is about Lee Harvey Oswald’s brief defection to the Soviet Union. The Kremlin, Savodnik says, will “allow you to think for a while that you have arrived. And then, of course, you realize you have not. “And then you begin to become a little bit crazy and mad, which is what happened to Oswald and what has happened to every single American who has defected or sought asylum in Russia…, Savodnik continued. Oswald, you may remember, came back to the United States and in 1963 was arrested on charges of assassinating President John F. Kennedy, but was himself assassinated before he could go to trial. As for Snowden, Savodnik says the Russians would want him far away as possible from the news media – and in the worst case scenario, they would send him to live in a remote region of the country. Wherever Snowden ends up, says Matthew Rojansky, director of the Kennan Institute at Washington’s Wilson Center, one thing is certain: no-one is going to trust Edward Snowden. “Because it’s understood: this is someone who would betray their own country and so that’s hard to respect for most ordinary people, including Russians,” Rojansky said. And Rojansky says the Snowden affair will inevitably affect relations between Washington and Moscow. “The Snowden issue is going to remain on those lists that senior American officials take into negotiations for years to come,” he said. “It may not be at the top of the list, but it will be somewhere on there. Analysts say there is no doubt Snowden would have a better life in a place other than Russia, but where that would be is anybody’s guess. Under US law, Washington should not provide military aid “to the government of any country whose duly elected head of government is deposed by military coup d'etat or decree.” However, many US companies would be affected by stopping military trainina dna equipment to Egypt. In 2010, Lockheed Martin provided Egypt with 20 F-16s as well as night vision sensor systems for Apache helicopters. Lockheed Martin is the biggest beneficiary of US government defense contracts, receiving a record $36 billion in 2008. Globally, Lockheed Martin is one of the largest defense contractors. Seventy-four percent of its revenues come from military sales. The US Army contracted this US-operated, Italian-owned military services company to provide vehicles, surveillance hardware and other resources to Egypt in December 2010. L3 Communications provided the Egyptian government with a $24.7 million sonar system and military imaging equipment. Deloitte, the world’s second largest professional services firm, won a $28.1 million Navy contract to provide planning and support for Egyptian aircraft programs. While most people know Boeing for its commercial flights, it is also the second largest defense contractor in the world. Boeing won a $22.5 million Army contract in 2010 to provide Egypt with 10 Apache helicopters. The Aerospace also received a contract to provide logistics support to Egypt. The world’s largest guided missiles provider gave Egypt and Turkey 178 STINGER missiles, missile launch systems and 264 months of technical support for the Hawk missile system. AgustaWestland - also owned by the same Italian company that operates DRS Technologies - secured a contract to provide helicopter maintenance for the Egyptian government. US Motor Works landed a $14.5 million contract in 2009 to provide engines and spare parts for the Egyptian Armament Authority. The US Air Force and Goodrich brokered a $10.8 million contract to obtain and distribute reconnaissance systems for the F-16 jets the Egyptian Air Force uses. Columbia Group provides $10.6 million-worth of unmanned vehicle systems, along with technical training, to the Egyptian Navy. These companies are characterized in the Iranian press as aggressors. Many Iranians were recurited and welcomed by Morsi to swell his Muslim Brotherhood ranks. It is largely foreigners who are keeping the streets red with blood. 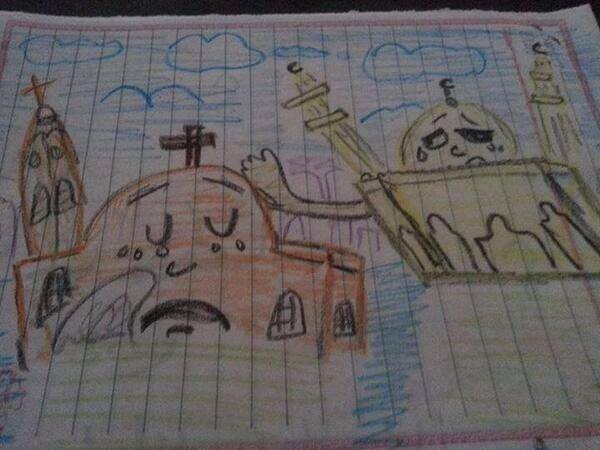 Egyptian child's drawing of the bloody conflict in Egypt. The Muslim Brotherhood burned 50 churches and Christian establishments on a single day. Note that the mosque weeps with the church and tries to comfort. 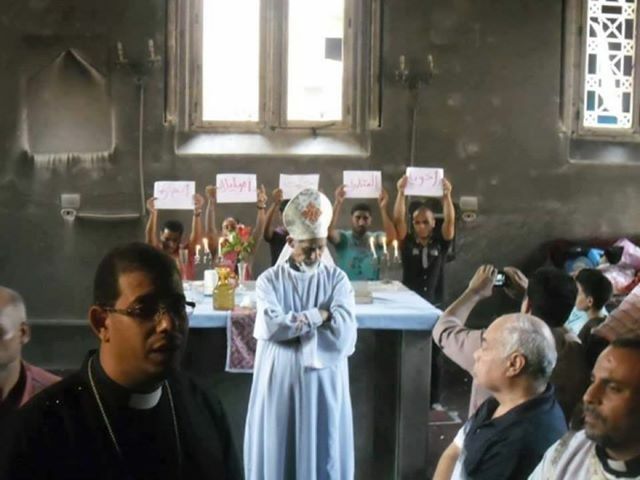 Christians at a burned down church in the city of Suez stood behind the altar with signs that read: "My fanatic brother, we came here to pray for you." Note the vested man at right front with the a scar on his forehead. He was formerly Muslim. 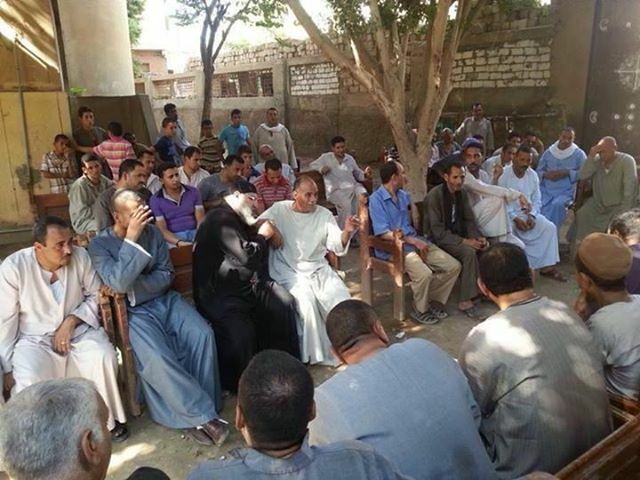 In one village, Muslim farmers went to the Coptic priest (shown below in black) and stayed with him and with other Christians guarding the village church. 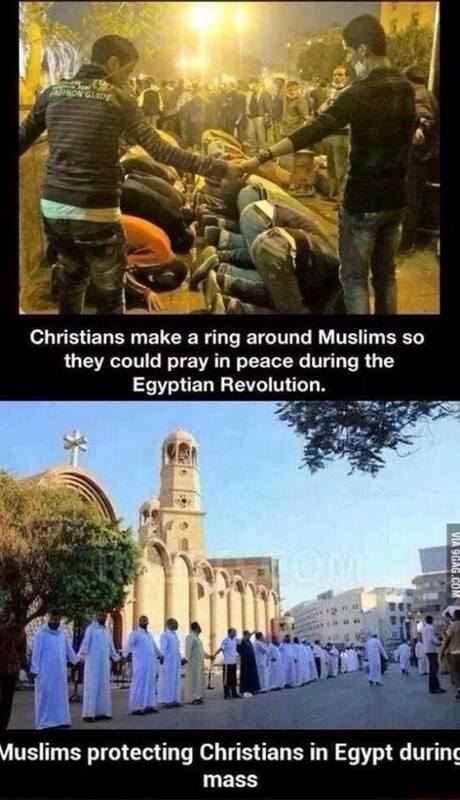 Muslims and Christians join hands to protect each other during prayer. Although the altar was totally burnt, the Christ Pantocrator icon was untouched by the fire at Mar Gerges Coptic Orthodox church in Asyut. MOSCOW, August 15 (RIA Novosti) – The Russian government urged its citizens Thursday to avoid traveling to Egypt, a popular tourist destination engulfed by riots over the sacking of an Islamist president that have already resulted in more than 500 deaths and the torching of churches. The death toll stood at 525 as supporters of the ousted Mohamed Morsi clashed with security services, The Associated Press reported Thursday, citing the country's Health Ministry. The pro-Morsi movement Muslim Brotherhood said police had used live rounds against civilian protesters and put the death toll at close to 2,000. Police denied using lethal force. The majority of casualties occurred after police cracked down on camps of Morsi supporters in the capital Cairo on Wednesday, dispersing them after a clash. Each side accused the other of using snipers to shoot indiscriminately at people involved in the riots. The list of victims includes at least two foreign reporters from the UK and the UAE, while a Russian television crew was robbed at knifepoint by looters in Cairo. The Muslim Brotherhood plans to stage a mass rally in Cairo on Thursday evening, Reuters reported, citing a statement by the group. The Russian Foreign Ministry said in a statement Thursday that Russians should avoid traveling to Egypt, while the Federal Tourism Agency called on travel agencies to sell fewer holidays to Egypt, one of the most popular destinations among Russians. But no plans were reported for the evacuation of Russians currently vacationing at local resorts, whose numbers were tentatively put by the Russian Tourism Industry Union at 40,000 to 50,000. The Egyptian embassy in Moscow called the Russian warnings "unfounded," pointing out that no Russian tourists have been harmed so far during riots. The Russian Orthodox Church expressed concern Thursday over reports that at least seven Christian churches had been torched in Egypt by Islamists, and that local Coptic Christians had been forced to flee the country over accusations that Christian minorities in Egypt had backed the ouster of Morsi, known for his Islamist views. Engineering divisions of the Egyptian military have been deployed to rebuild the churches, local media said Thursday. Morsi narrowly won the presidential elections in May 2012 that followed a revolution that ousted his authoritarian predecessor Hosni Mubarak, but was removed from the presidency in July in a military coup d'état that came after months of street protests by Morsi's opponents. Morsi is currently under house arrest, which was extended until Sept. 15 on Thursday, local media reported. The ouster polarized the country, with Morsi's supporters replacing his opponents in the streets. The military declared a nationwide state of emergency in an attempt to stop the violence. Several European countries, including Germany, France and Italy, have expressed concern over the situation in Egypt, as has US President Barack Obama on Thursday. Russian President Vladimir Putin has made no recent comments on the ongoing crisis, but warned soon after Morsi's ouster against a possible civil war in the most populous Arab nation. 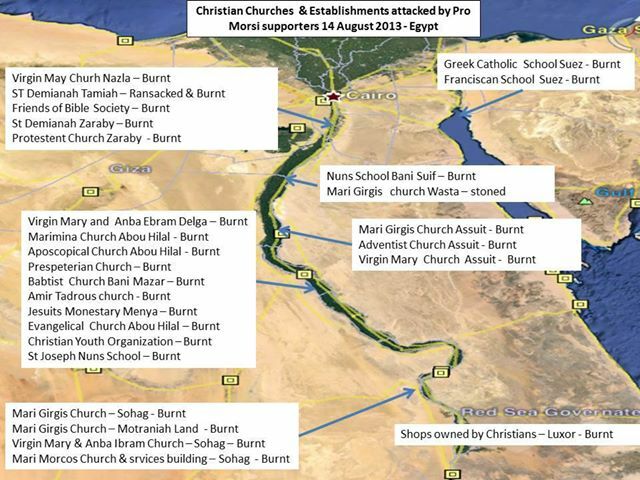 At this date at least 50 churches have been burned by the Muslim Brotherhood. The Muslim Brotherhood executed a well organized attack against Christians in Egypt on Wednesday, August 14. Running the length of the Nile, and in Suez, churches were burned, as were shops belonging to Christians. Over 200 Christians lost their lives and the American media once again showed its bias by ignoring the tragic events. 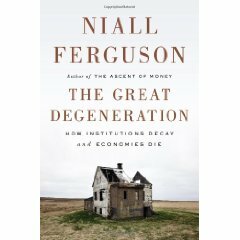 If you suffer from melancholia, or display other symptoms of clinical depression, you might want to skip reading Niall Ferguson’s The Great Degeneration: How Institutions Decay and Economies Die. For the rest of us, it is an essential grounding in the daunting realities facing the current and future generations of the Western democracies, especially the United States. Ferguson, a Scottish transplant to Harvard and a senior fellow at the Hoover Institution, based this book on his 2012 Reith Lectures for the BBC. Warning: Things are even worse than you thought. Ferguson’s short, articulate, and powerful book describes a quartet of pathologies plaguing the United States and most Western countries: “democratic deficits,” “regulatory fragility,” the “rule of lawyers” rather than the rule of law, and an “uncivil society.” Ferguson believes these conditions have contributed to making the US a “stationary state,” a term coined by his countryman, Adam Smith. This has led to “a shocking and perhaps unparalleled breach” of Edmund Burke’s partnership which the great Anglo-Irish conservative described as “not only between those who are living, but between those who are living, those who are dead, and those who are to be born.” Ferguson relies heavily on contemporary scholarship but also draws on the intellectual legacy of the formidable triumvirate of Smith, Burke, and Alexis de Tocqueville. U.S. Secretary of State John Kerry has said Washington still has 'shared interests' with Russia, despite deteriorating relations, most recently over the case of fugitive intelligence leaker Edward Snowden. The meeting in Washington follows the announcement from the White House on August 7 that President Barack Obama was canceling a one-on-one meeting with Russian counterpart Vladimir Putin scheduled for Moscow next month. The meeting also included U.S. Defense Secretary Chuck Hagel and Russian Defense Minister Sergei Shoigu. It is expected to focus on the situations in Afghanistan, Iran, and North Korea, and U.S.-European plans for a missile-defense shield that Russia strongly opposes. Ties between the United States and Russia are strained over several issues, one being Russia's decision to grant Snowden, a former U.S. intelligence contractor, temporary asylum. Snowden leaked classified information about U.S. global Internet- and telephone-surveillance programs and faces espionage charges in the United States. Washington has also been frustrated by Moscow's continued support of Syrian President Bashar al-Assad amid the country's devastating civil war. The United States supports rebel factions in the country and wants to see Assad leave power. Moscow, for its part, has been concerned for several years about the joint U.S.-European plan to build a missile-defense shield in Europe. Washington says the system is intended to protect NATO countries from a possible attack from Iran, but Moscow argues it could affect Russia's nuclear deterrent. The United States has also expressed concern about what it says is a crackdown on civil society in Russia since Putin returned to the Kremlin last year. There have been increased protests in the United States over a Russian law adopted this summer that criminalizes the 'propaganda' of homosexuality to minors. That law and another requiring nongovernmental organizations that accept foreign funding and engage in 'political activity' to register as 'foreign agents' have led to calls for the United States to boycott the 2014 Winter Olympics in Sochi. The Obama administration has said it is not considering a boycott. On August 8, Russian Sports Minister Vitaly Mutko defended the gay-propaganda law. 'I want to calm everyone down first of all, as in addition to this law on the territory of Russia, we have the Constitution of the Russian Federation that guarantees all citizens the right to a private life, guarantees that there will be no interference in this private life,' Mutko said. Mutko added that the law should not affect the Sochi Games. Afghan President Hamid Karzai has repeated his call for Taliban to give up militant activities and join the Kabul government-led peace process in Afghanistan. 'Come and serve your soil and put down the weapon which the stranger has put on your shoulders and that you kill your people with. 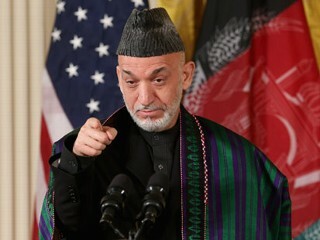 Put it down and serve your people,' Karzai in his Eid al-Fitr message on Thursday, marking the end of the holy fasting month of Ramadan. He said the militant group was pursuing the interests of foreigners in the war-torn country. MOSCOW, August 1, 2013 (LifeSiteNews.com) – Vladimir Putin has urged the world’s political leaders to stop the violent persecutions against Christians that have erupted in many Middle Eastern countries. In November 2009 a Russian Orthodox priest was gunned down in Moscow by a jihadist. Does the Binary Feature Signal Greater Complexity? Is Bioethics a Dirty Word? Have Ethics Disappeared From Wall Street? What are Common American Censorhsip Laws? China Improves Military as Part of "National Rejuvenation"
Female Circumcision or Female Genital Mutilation? Lower Solar Irradiance, Higher Atmospheric Temps? US Policy on Israel: "A one man show"
Yale Education a "cheap hodgepodge"
Brain Dead Woman Wakes Up! California's Ban on "Conversion Therapies"
Where is Our National Spine? What Should Americans Do After the Supreme Court Ruling on Obamacare? UK Entering Designer Baby Market? Does NBC Hate Religious Conservatives? Did Hobbes Change the Meaning of Justice? Any Legal Talent Outside Harvard? Russia Rejects UN's "Evolving Morals"
Karl Barth's Critique of the Religion of "Good People"